Are you looking for a passionate, fun, supportive team to join? If so, we would love to hear from you. As one of the foremost providers of specialist care in the Northeast, we are recruiting a Care Coordinator to join our team in Newcastle. Routes Healthcare Preston are pleased to announce they have moved to their new offices located at Preston Technology Centre, Office G03, Marsh Lane, Preston, PR1 8UQ. This week we were delighted to welcome our HCA Saffron into our new location. Please feel free to visit us in our new office. 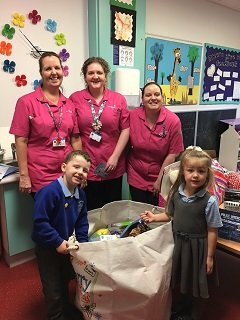 Our Tameside branch would like to say a huge thank you to everyone who donated toys to the children’s ward at Tameside hospital. The branch has received a lovely card from the children's ward to thank all the carers for their donations.